ship to break through a Union blockade at Savannah. 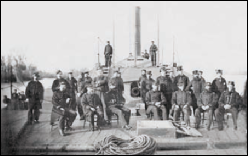 converted into a confederate warship called â€œThe Atlantaâ€�. against Southern troops at Richmond and Fort Powhatan. During his lifetime George Thomson remained heavily devoted to his business and was rarely seen in public. and modest man, despite his success it is recorded that Thomson never lost the broad Anderston â€œDoricâ€� in his speech. He died on 29th June 1866, aged 51.